2012 Update: Breyer's has ditched the "Smooth & Dreamy" nomeclature. Now there is just a mark that says "Deliciously Rich & Creamy". That's right, I purposely bought FAT FREE ice cream. I must be losing my mind! hehehehe. After two and a half years of blogging, I can't tell you how hard it is to just buy something. I think I may have lost the ability to buy something twice. It's a little scary actually, in a freeing your mind kind of way. I basically oppose fat free junk at every turn BUT this is strawberry, and if any flavor can pull this off, it's gonna be strawberry. Oh, before we start, I will mention that no where on the container does it say "all natural" like pretty much every other Breyers creation. This disappoints me because this is Breyers, I trust them to keep it real, and I already see propylene glycol monesters, but I'm going to give this a shot anyway. So here is the happy green container. 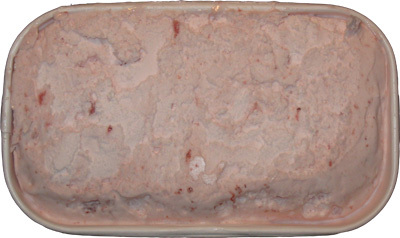 It sure looks like ice cream, and ofcourse they taunt us with chunks of strawberries, but I am afraid. 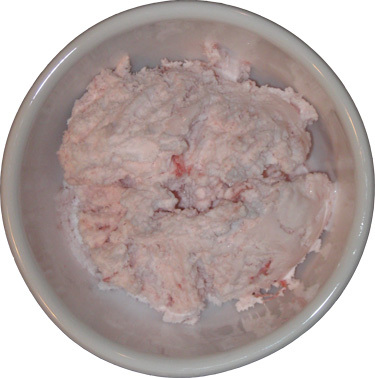 Do you ever wonder when companies went from strawberry ice cream to strawberry FLAVORED ice cream? ok, maybe it's just me. So here it is and it does look, well, weird, almost like angel food cake or something fluffy like that. I'm getting pretty tempted to try it.... oooooo, I just scraped the melting bits from the lid and this stuff is not making a good first impression... reminds me of the pink amoxicillian they give to kids... not a good start. ok, clear the mind, let's try again. That weird fluffly look continues. This ice cream is from the deep freezer yet it's melting instantly. I will admit that I am afraid... very afraid really, but we must press on! Well, I've finished my bowl and the one word that sums it all up? unnatural. This is just an unpleasant, slimy, medicine like texture to the whole ordeal. You know me, I always say you can't mess up strawberry, but here we are, with messed up strawberry. They did try, and it is creamy, but in a way that will probably take awhile to get use to. Even the strawberry flavor seems messed up somehow, distorted really. There are occasional strawberry bits, but it feel like there is about one per half cup serving and they are pretty small. Right now, I can't even say this stuff is worth trying unless you are really bent on losing weight but need a quick fix. You are better off with a nice low fat ice cream rather than going to straight up, chemical, fat free junk. I can honestly say I'm disappointed, but not really surprised. 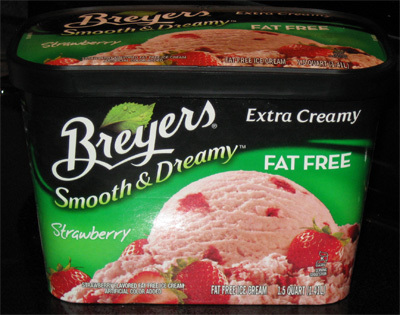 Breyers has tried to make this thing creamy and fat free, and they succeeded at 90 calories a serving, but it just feels so very, very wrong. On Second Scoop: Ok, I went back in with immensely lowered expectations. Ok, I was afraid really, but rather than scooping something new last night (and not having the energy to talk about it), I decided to go back in and try to salvage something good from this experience. You know how 2% and whole milk have a nice, full, rich texture to them. And you know how fat free and 1% really just taste like watered down milk? Well, I hate that. The great thing about (fat) milk is the way it fills you up. That's not here. They've tried hard to make it creamy, but deep down, this stuff is like drinking skim milk and therefore unsatisfying to me. If you drink 1%, you might actually like this (and it's fat free milk aftertaste), but it's not for me. I was tempted to crush a cookie on top last night to give this stuff some grit. I think I might try making a small milkshake out of it with some 2% milk to see what happens. Could you be more descriptive with how it differs from a better product? Something in terms of mouthfeel. The sweetness? Is it gummy? YUCK! There should be a rule against fruit in ice cream in general! It's not so much gummy as it is slimy. Unnatural is the nicest word I can think of. It's almost as if it's foaming in my mouth! How's that for a description? !